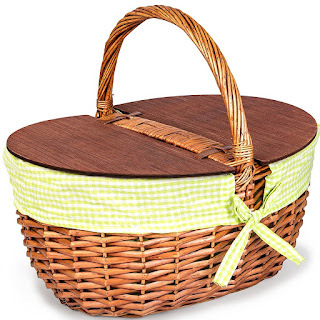 Natural Vintage Style Hand Wicker Picnic Basket - $42.99 + FREE Shipping w/Prime! 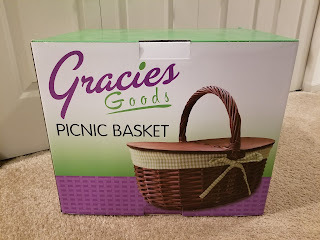 Check out this beautiful natural vintage style hand Wicker Picnic Basket by Gracie's Goods for $42.99 + FREE Shipping w/Prime! ❤ ENJOY A ROMANTIC PICNIC ANYTIME. Enjoy the memories of yesteryear and take a trip back to a simpler time with a romantic picnic with your loved one. And our vintage design picnic basket will add a perfect touch for such an authentic romantic moment you will treasure forever. ❤ NATURAL HAND WICKER WEAVING. Our stylish picnic basket is hand woven wicker for the ultimate durability ensuring years of wonderful picnics to remember. 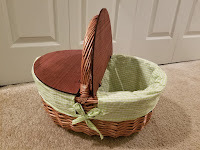 Our baskets are beautifully lined with a green and white gingham finish and matching bow for that extra touch of class. ❤ ENJOY A PICNIC ALL YEAR ROUND. A romantic picnic is not only reserved to warm spring afternoons by the lake or late summer nights. Treat your other half to a cozy intimate picnic by a roaring fire in a winter cabin. Our picnic basket is great for any seasonal occasion. ❤ MAKES A BEAUTIFUL WEDDING GIFT. 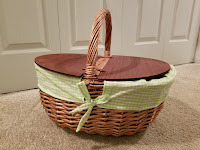 What better gift for a newly wedded couple than a stylish vintage picnic basket that will last the long and happy life they are beginning? Our picnic baskets come in a beautiful presentation box that need no further gift-wrapping. Don’t you wish sometimes that you could escape hectic modern day life and spend some quality time with your beloved? Sharing quality moments with your partner keeps the foundations of your relationship strong and builds wonderful and long lasting memories. So, what better way than going on a romantic picnic and sharing some delicious food and fine wine together? Our beautifully designed wicker picnic basket is inspired by the traditional woven vintage baskets of yesteryear, a time when life was simpler and moved at a slower pace. We want to take you back to that time to leave behind the modern hectic lifestyle for a few hours and enjoy a wonderful romantic moment with your loved one. Any time of year is perfect for a picnic even in the frosty cold of winter. Imagine snuggling up to your man beside a roaring fire enjoying fine wines and delicious cheeses beautifully arranged in your stylish picnic basket. NEED MORE REASONS TO CHOOSE OUR INCREDIBLE PICNIC BASKETS? 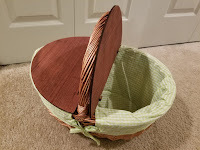 ✔ A traditional hand woven deep brown wicker basket that is both durable and classically designed to last. ✔ Finished with a green and white gingham liner to keep your food protected. ✔ Two sided opening sturdy wooden lid that double as a surface to rest your drinks or plates. ✔ Comes in a beautiful and stylish gift box. Makes a wonderful romantic wedding gift. ✔ ABSOLUTELY FREE E-BOOK “Where Is Your Picnic Basket?” with every single purchase. SO, WHY WAIT? CHOOSE US NOW AND ENJOY SOME ROMANCE WITH YOUR LOVED ONE TODAY!